Today was a fun and exciting day! The students not only dressed up for Halloween, but the school turned into 'Hogwart's Academy' and the teachers/staff all dressed up as one of the characters from Harry Potter. I dressed up like Professor Snape with my long hair and black robes. The students enjoyed the day and shared their Halloween snacks with their classmates. They were full of energy all day long! 1.) PARENTS: Click here to sign up for a preferred time for your parent/student/teacher conference. Watch this video. There will be a quiz on the coordinate system tomorrow. Make sure you are comfortable plotting points.Complete the coordinate jack-o-lantern diagram if you haven't done so already. How will you stay safe tonight when you're trick or treating? List at least 3 different precautions you are taking today to make sure you keep yourself safe? NOTICE TO PARENTS: Please click here to schedule a student led parent/teacher conference. I will e-mail you or relay a message to your child to confirm a date/time as close to your preferred time as possible. I can tell tell the difference between a summary and a paraphrase. I can summarize or paraphrase an article. Click on the links below to let the class know what you're bringing tomorrow! In YOUR OWN WORDS, explain the difference between a summary and a paraphrase. To enhance our physical education program, we buddied up with Mr. Richardson and Mr. Tito's classes and visited the Cloverdale arena for a group ice skate! I was impressed with all of the students and how they behaved in a respectful manner on and off the ice. One student said, "Mr. Hong, check it out! I'm better than I was last year because I've practiced a few more times!" It is so great to see all of them putting the R.O.L.E.S. into action. Upon returning to the school, we reviewed the R.O.L.E.S. so the students could refresh their memories as to what respect looks like inside and outside of Hillcrest Elementary. 1.) PARENT/TEACHER/STUDENT CONFERENCES: Parents, if I haven't had an opportunity to meet you, or if you would like to come check out the learning that has taken place over the last two months, please click here to choose your preferred date and time slot. I will do my best to accommodate your PREFERRED time slots. MATH 7: Test Corrections. Return signed by your parents. 4.) LA: Complete your paraphrasing handouts. Explain how the R.O.L.E.S. relates to your life. Some of you may want to reflect on your behaviour today when we had a guest in the classroom. Why should we show respect to others? Today, I had the pleasure of hearing the words of a student taking ownership of his learning. James came up to me this morning during Science and asked me, "Mr. Hong, can you tell me how to improve my work?" Although he is a new to our school, he is learning.....how to learn! To all my students, keep up the awesome work that you do every day! For review, scroll back over the past few weeks of posts and watch the review videos that were posted. 2.) SCIENCE: Ecosystem web projects are due tomorrow. Bring $3 if you are renting skates and $1.50 if you need to rent a helmet. If your parents haven't filled out the permission form yet, they MUST do this or you will be unable to participate. Parents, click here! Click here to read the letter to parents. Parents, we will leave the school at 11am and will be skating from 11:45am until 12:45pm. List two things you have learned about working with soapstone. Are you enjoying working with soapstone? Why or why not? Today, the students continued learning about ecosystems and enjoyed classifying communities that exist in three different ecosystems. Through my informal observations, every student in the class was able to classify the organisms into the different categories (Producers, herbivores, carnivores, omnivores, detrivores, and decomposers) For inspiration, they all worked outside on the grass where they were able to work in small groups to complete their work. One student went so far as to say, "Mr. Hong, we are invading the ecosystem that exists in the grass and soil!" I can classify organisms into the following categories based on what they consume and/or what they do to survive: Producers, Herbivores, Carnivores, Omnivores, Detrivores, and Decomposers. MATH 7: Any assigned work. Complete typing/writing out all your labels for the organisms in the ecosystem you chose on Friday. Cut them out and paste/border them on coloured paper. You must have these ready to work on your projects on Monday. Parents: Click here to complete the digital permission form for ice skating on Tuesday, October 29th and Monday, December 9th. Click here to read the parent letter. Improve, add or change at least 3 adjectives (words that describe nouns) in each of your 3 passion paragraphs. Post your original paragraph here and then your revised one underneath it. Today was a wonderful day of learning! The students were able to see real-life connections from what they learned in Science to the real world! We had a special presentation today by some arborists who will be planting trees on our school grounds. They talked about the importance of trees and how they are essential to life! In addition to this, they also talked about photosynthesis, oxygen, carbon dioxide, and glucose. One teacher mentioned to me that all of the Division 4 students looked like they wanted to share their science connections with our special presenters. LEARNING INTENTIONS: To convert incomplete sentences into complete sentences by using conjunctions (IE and, either, neither, because, etc), commas, and periods. You must convert all incomplete sentences into complete sentences in all 3 of your paragraphs. There is a QUIZ tomorrow and it will be based on this video. Be sure to review it! Test must be returned and signed by your parents. Also, corrections must be completed. Mid-chapter review must be completed, marked, and corrected. Make sure you have your piece of cardboard at school tomorrow. We will start our Food Web projects! (As long as it is about 30cm by 30cm, it should be fine. Then, post your revised sentence(s) by combing the shorter sentences together using conjunctions or by splitting up longer sentences to make shorter ones by adding punctuation. Today, students started learning about setting/volleying technique in PE. Students learned if they use their legs and their arms at the same time, they will gain greater control and power when they are setting the ball. In addition to the fun the students had learning about volleyball, they also started working on their soapstone carvings. They drew their animals, did some etching, and also cut out some of the negative space that they did not need. Click here to read the 100 WC writes! Click here to vote for your favorite 100 Word Challenge Write! 2.) MATH 6/7: Any incomplete work. 3.) PARENTS: We will have a student led conference next Wednesday from 3-4pm. In your own words, explain what a food chain is. In your own words, explain what a food web is. Type out a food chain for the organism you did your nested ecosystem on. If you have any question, please post them here. 5.) SCIENCE/ART: Bring a piece of cardboard to school tomorrow. It must be at least 30cm by 30cm. MONDAY: TEACHER FEEDBACK BEING PUT TO USE! Today, the students individually shared their passion paragraphs with me and I gave them feedback on their paragraphs. Most students will have to add transition words to their paragraphs and they will use the list in their binders to do this. In addition to this, most students will also have to add adjectives to create better images. LEARNING INTENTION: To use the feedback given to me by my teacher to improve my paragraphs. If you haven't completed your passion paragraphs, be sure to complete your first drafts. Many of you are already working on your first round of edits/revisions. 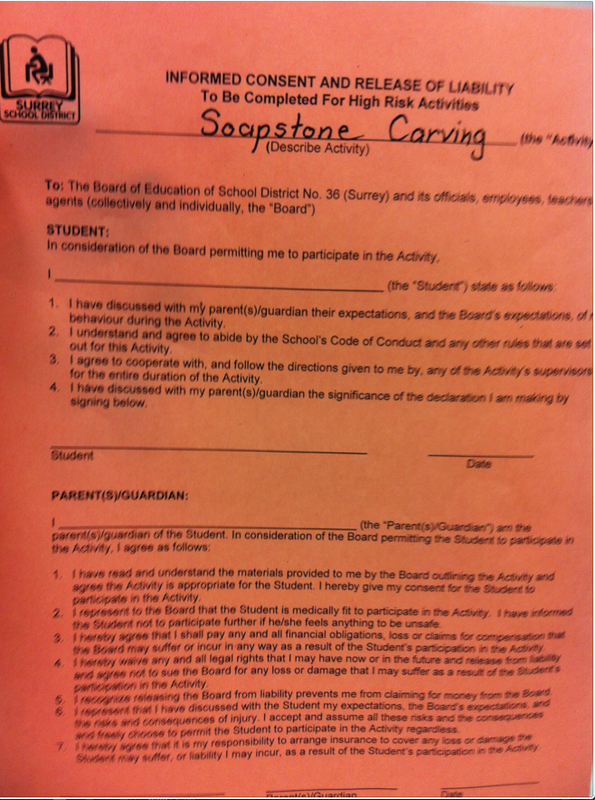 We will be starting soapstone art tomorrow afternoon. Make sure your materials are at school tomorrow - apron or old t-shirt, toothbrush, rubber gloves, and a plastic bag to store all your materials. Click here to download a copy of the waiver. If you are one of the students who has not returned this, be sure to do so. If you are one of the students who hasn't returned your permission form, be sure to have your parents write a short note to me giving you permission to participate. Do a little research and post an example of a detrivore and a decomposer. Be sure to explain why each organism/animal is considered a detrivore and/or decomposer. Be sure to briefly explain why your organisms are considered detrivores and decomposers. Include a link of where you found your information. Today, the students learned about the food chain. They learned about producers and the process of photosynthesis. They learned about the non-living parts of the environment that help keep the cycle of life going. Plants need carbon dioxide and humans need oxygen. Plants obtain their nutrients from the sun, soil, and water. They also provide us with oxygen and food which we cannot live without. LEARNING INTENTIONS: To understand and be able to explain in my own words, the importance and the process of photosynthesis. Follow the criteria for writing paragraphs that you have been working on this week. Complete your first drafts on your Google Drive document. 2.) MATH 6: Pg 80 Qu.2, 4, and 5. Pg 84 2a, 3, 4, 5, and 6. Due for Monday. Watch this video on prime factorization. Starts next week so be sure to bring all your materials - apron or old t-shirt, toothbrush, rubber gloves, and a plastic bag to store all your materials. If you are one of the students who hasn't returned their permission form, be sure to have your parents write a short letter to me giving you permission. Watch this video to review what you learned today. In your own words, describe the process of photosynthesis using the scientific terms you learned in class today. Be sure to use words such as chlorophyl, photosynthesis, oxygen, carbon dioxide, nutrients, water, etc. BONUS: Create a video that demonstrates the process of photosynthesis and post a link here. Today, I stood back in amazement as all of my students diligently worked on their writing assignments. We continued working on organizing and building paragraphs today. As a teacher, it makes me proud to see my students learning and enjoying it at the same time! To quote Sean, he said, "I completed all three paragraphs because I enjoy writing when I have the choice of what I can write about!" Not only did the students write their own paragraphs, they also read their neighbours paragraphs to ensure they were following the criteria and also gave them one thing they should improve in their writing. 1.) MATH 6: Pg 80 Qu.2, 4, and 5. Pg 84 2a, 3, 4, 5, and 6. Due for Monday. Watch this video on prime factorization. II.) What was the cause of this change that led him/her to feel happier at school? III.) How has this incident/cause changed his/her perspective or view of school? Remember to include: An inviting lead/hook and 'TOPIC SENTENCE", answers to the questions above (Supporting sentences - examples, quotes, statistics, etc), and a concluding sentence. Be sure to use transition words. This is a great list that you can use! Ask 2 students quality questions about their paragraphs. Give 2 students positive comments! Don't forget your digital citizenship and the R.O.L.E.S. when posting. Be respectful at all times!